You can manifest money – without struggle or worry. Manifesting money is all about your energy. It’s about letting go of a scarcity mindset where you think there isn’t enough money, and welcoming in more fun, happiness, security and prosperity into your life. But sometimes it can be hard to manifest money when you’re afraid of not having enough money to pay your rent, buy food, pay for tuition…any time you’re desperate for money. Or maybe you feel like you've hit a wall in how much money you can have…or you simply want more money. 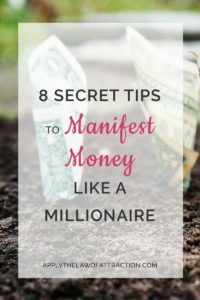 Here are my 8 tips to manifest money. They can help you attract wealth and abundance easily. What is the specific amount of money that you want to manifest? The more specific you are, the easier it will be for you to manifest it. Forget about how badly you need money or how little you have now. Don’t get upset when you have to pay a bill or an unexpected expense arises. This will only block the flow of money to you. Instead, focus on what you do have. Loving your money will open you up to greater abundance. When you change your energy to that of abundance, you welcome money into your life. You can do this by wearing your best clothes (even if you’re at home watching TV), saying affirmations or repeating mantras. Cleaning your house or apartment can also help you to feel more prosperous by clearing out any cluttered, dirty energy. How would you dress and live if money were not an issue? Income…expenses…millions of dollars…massive debt… It’s all just energy. It’s neither good nor bad. It’s simply an expression of the energy you have been vibrating at. Stop making money important and start seeing it as the energy it really is. Everyone is on a different life journey. Where you are is exactly where you need to be. It is no better and no worse than anyone else. You don’t need to compete with anyone. Just do your best. If you struggle to manage your money now, it will only become harder as you have more money. Learning to manage your money now will help you in the future, and will make it easier for you to increase your wealth as your money will work for you, instead of you for it. Money is a topic that can generate a lot of different feelings (and energy) for people. This is why it’s really important to make manifesting money fun. The more fun you have, the more likely it is that you are vibrating at a frequency to attract money to you. That means that you don’t even have to do anything related to money to attract money to you. You can manifest money by doing anything fun – playing with your kids at the beach, watching a funny movie, or going to Disneyland. Maybe you desire to take a first-class vacation or to retire early. But if your unconscious money beliefs tell you that you don’t deserve it, chances are it will never happen for you, no matter how religiously you follow the above steps. That’s why it’s important that you believe you deserve all the love, success, and abundance that the Universe can give you. That’s why I recommend you take Natalie Ledwell's Ultimate Success Blocker Training – absolutely free. To get started, take Natalie's Free Success Blocker Quiz now and discover your #1 limiting money belief. I took the quiz myself, and I have to say, I was surprise by my results. Which is slowing down and complicating my money goals! I have to admit…it is a surprise. Yes, growing up I did have certain teachers and family members who put me down, but I thought that after all the work I've done, I'd be free of this by now! The good news is that the quiz also showed me what I must do to erase this belief for good – and it felt extremely liberating! Because I believe you'll benefit greatly by learning your #1 limiting money belief too. I would NEVER send you in the direction of something I didn’t think would be life-changing for you. So you can rest assured that you’ll be in great hands in Natalie's world. You’ll discover SO much about yourself and your unconscious money beliefs just by taking this quiz — but it gets even better, because after you receive your results, you’ll also be automatically receive free training program to help you apply what you’ve learned straight away. And with the Ultimate Success Blocker work, it’s like pressing ‘reset’ on your money story! When you know what’s been holding you back, you can pave a brand-new path to a brighter future with the financial freedom and impact you really want (not to mention being able to manifest everything on your vision board). The quiz is quick and easy, and the results are instant – try it now before it goes offline. The thing about limiting money beliefs is… you might not even notice they’re there until they’re SHOWN to you. That’s when everything rushes into clear perspective and you realize that so many of the negative habits, emotions and decisions that hold you back from your true potential… often stem from just ONE destructive belief!